The first step it to make the brine. The brine is an important step in the smoking process. The salts and sugar in the brine help to allow the fish to dry as cooks while still retaining the moist flavor. The brine will serve like a marinade to soak the fish in prior to smoking. To get the brine started boil ¼ of the total water in a covered pot. Once boiling remove from heat and add all the spices other than salt and brown sugar. Let steep for ten minutes. After ten minutes mix with the rest of the water, salt and brown sugar. Marinate fish fillets in this brine for about an hour. While the fish is in the brine, soak 4-5 cups of wood chips in water for an hour. 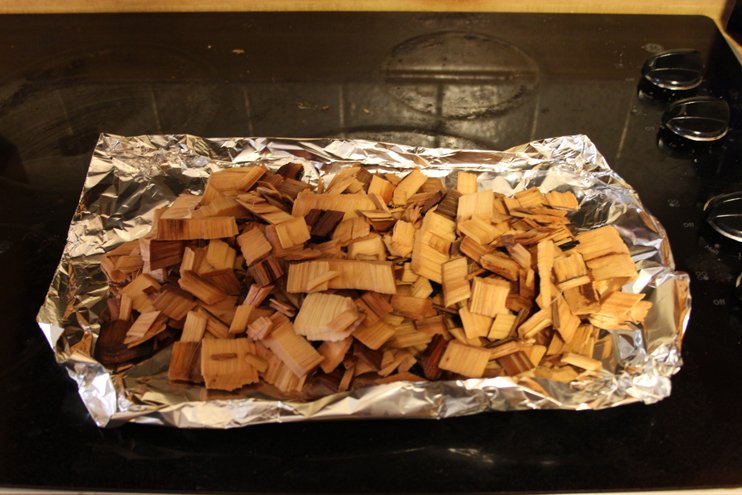 Then wrap the wood chips in foil and poke some holes in the top. I set the grill up with the grate out of one side. 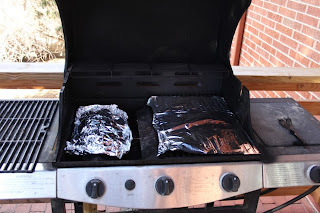 I placed the foil packet of wood chips directly over the left burner. 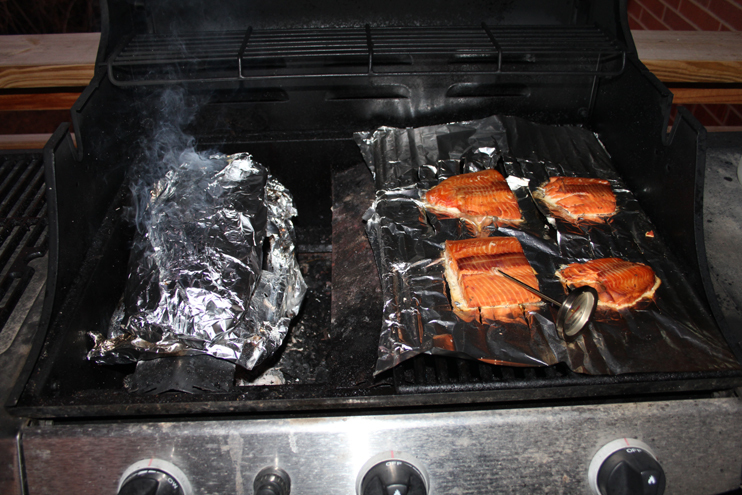 I started the burner under the wood chips about fifteen minutes before the fish was done in the brine. Once the hour is over and you are ready to put the fish on the grill remove it from the brine and rinse it in tap water. Then carefully set the fillets on the grate being careful that they don't fall apart. 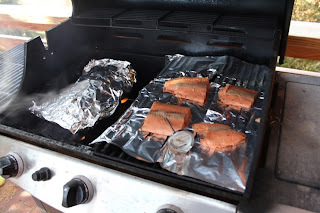 We placed them on the right side of the grill on foil to reduce sticking. I also used a meat thermometer in the thickest piece of fish to monitor the internal temperature. I used the built in thermometer to keep the grill temperature around 225 degrees. This required some adjustment through out the cook time due to winds and the woods chips catching on fire a couple times. I was aiming for a internal meat temperature of about 165 degrees. Over all it took about 90 minutes for the meat to reach an internal temperature of 170 degrees. 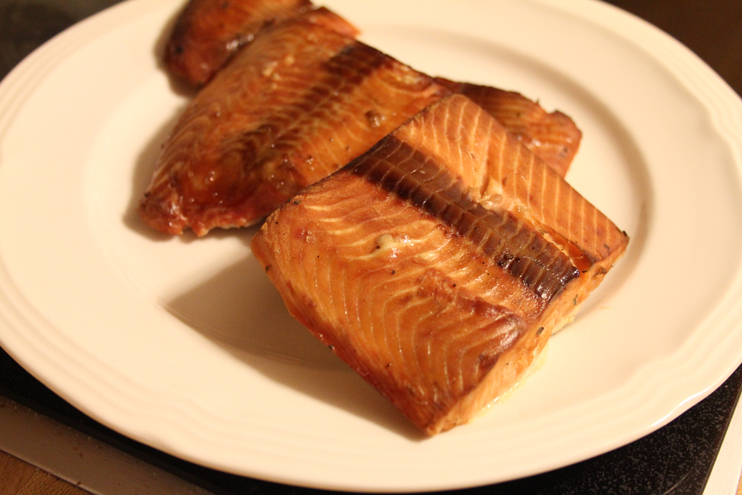 ﻿The final salmon turned out great! 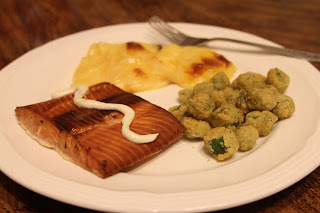 It had a very distinct flavor that gave it much more character than just a normal baked salmon. We served it up with some scalloped potatoes and okra. If you want to give this recipe a try remember that you can adjust the taste by leaving the fish in the brine longer, or rinsing it off in tap water before placing it on the grill. Trolling lead core is a great way to cover lots of water. I have been thinking a lot about lake fishing recently, looking forward to the ice melting off of the lakes around here. Once you get out on a lake there are a number of ways to get where the fish are. Trolling is one of my favorite methods. 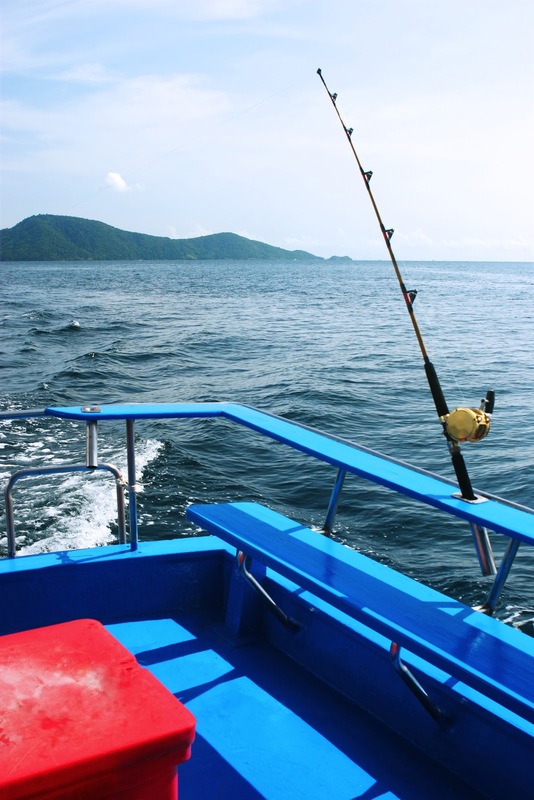 Trolling is a method of fishing where you use a boat to move your lure or bait over a large section of water. There are many different ways to present your bait when trolling, but I would like to look at one method in particular, trolling with lead core line. Lead core line is a type of fishing line designed to get your lure deeper into the water. It consists of a braided sheath around a core of soft lead. This gives the line quite a lot of weight, which helps your bait to sink without the use of additional weights attached to the line. Since the line is serving as the weight you don't have to worry about attaching anything to the line other than your lure or bait. This makes it easier to switch between baits rather than re-rigging complicated weight systems, or having to work around a dipsy diver or down rigger. Lead core line comes in multiple weights, just like normal fishing line. It also comes in spools of different lengths, varying from 50 feet to 200 feet. Typically the outer layer of the line is color coded in ten yard intervals. This allows you to guess about how much line you have in the water by looking at the color you are out. This is also important for figuring out what depth you are fishing at. The exact depth your lure will be at will depend on several factors, not only how much line you have out, but also your speed and type of lure. 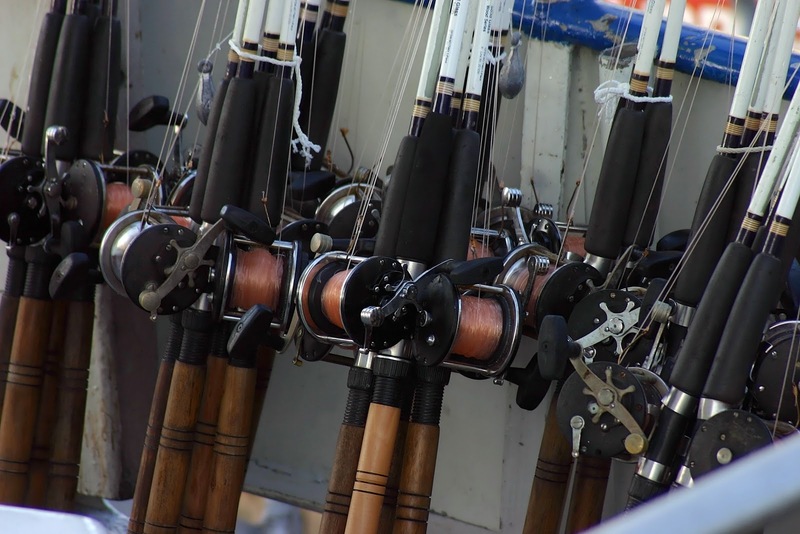 As a general rule of thumb your line will sink about five feet for each color that you have in the water. So as an example let's say that you noticed fish holding at about 25 feet below the surface. You will want your lure to be at the same depth or just above the fish so that they will notice it go by them. To get to 25 feet you will let out five colors of line. This should put you about where the fish are. If you want to know more specifically how deep your lure is compared to the general five feet per color rule, here is a trick: Try to travel over a fairly level section of the lake, get a reading of the depth to the bottom with a fish finder or depth sounder. Then start letting out your line until you feel it hit bottom, let's say at 30 feet. From there you can look at the amount of line that you have out and compensate for the actual depth you want. For example, if you let out 7 colors instead of six to get to 30 feet you know that for that speed and lure you will have to let out a little extra line to get to the right depth. To get to those fish at 20 feet you might want to let out about 4 1/2 colors. One last thing to consider about lead line is the very significant amount of line that you will have out. If you let out 4 colors that amounts to 40 yards of line, plus your leader which could be up to 50 feet. This means that you will have to reel for a long time if you have several colors out trying to get to deeper fish. It also means that because of the weight of all that line you will have a harder time feeling what the fish is doing at the end of that line. One very big advantage of the long length of line that is out is your lure will be getting to the fish long after your boat has passed, making them less spooked than if your bait was right behind the boat. How would you like to have this much tackle ready to go? Hopefully this will give you a quick idea about what it means to troll with lead core line. I will follow this post up with more information about setting up lead core line and actually using it. If you're like me you enjoy the video technique called time lapse and have wondered how to create one. A couple months ago I decided I wanted to learn how to make time lapse videos myself, but I had no idea how to start. I spent many hours on the internet looking for descriptions on how to make the videos. After much searching I finally decided to try it out. My first time lapse is actually available at Fotolia and Shutterstock. So what does it take to turn your pictures into a time lapse video? Most movies use 24 frames per second (fps) and TV uses between 25 and 30 frames per second in their video. This means that what appears to be smooth video is actually as series of still images displayed between 24 and 30 times per second. Your mind interprets that movement as a smooth video. You then have to figure out how you want your video displayed, I chose 30 frames per second for my videos, so we will use that for the examples. To figure out how many frames you need, first decide about how long you want the final video to be. For our 30 fps example we would need 300 photos for just ten seconds of video. That's right, you need a lot of photos for this. So, the first thing to think of for time lapse is that you will need a sturdy tripod. The camera needs to be still for the entire duration of the photo session. You will also want to be able to set the settings and exposure of your camera to manual. The exposure will need to be the same for each photo in the series, otherwise your final video will change brightness while it plays. Now you will need a way to trigger your camera repeatedly for the duration of your photo shoot. You can just push the shutter button, but doing that several hundred times gets old fast. The next option would be to use a simple remote shutter release. These usually have a short cable and attach to your camera. This is what I used for my first time lapse, which is posted at the links above. I was using 6 second exposures and had to depress the shutter on the release every five seconds. I sat on the ground next to the camera for the better part of an hour and created nearly 400 exposures. Though that worked, I decided to find a more effective method. One way is to use your laptop to control your camera. If you use a Canon DSLR camera you can use the included software. Using the EOS Capture software will let you control the camera, including setting the exposure intervals between photos. Another advantage is that you can save images directly to the hard drive, reducing your dependence on high capacity memory cards. The biggest disadvantage is the fact that you have to power the laptop for the entire duration of your shoot and you have to have the laptop out with your camera, which may not be desirable when you are out in the cold or bad weather. A laptop is easiest to use inside or where you have a power source readily available. I have used this method for creating a time lapse video of a hardwood floor installation. Once you have your photo series you will need to save it to your computer. I like to save the photos into their own folder, making them easier to locate for the video.﻿ If you want to edit the photos or change exposure make sure you use a program that will allow you to edit all of the photos in the same way. As I mentioned before you don't want the exposure to change through out the video or it won't appear right when they are put together as a video. Next you will have to decide how you want to convert the photos into a video. Some free programs, like Windows video maker will turn your photos into videos, but may only allow you to set the video to 8 fps, which will not make a smooth video. The program I decided on was Quicktime Pro. By paying the $30 for pro version you get the ability to create a video using the frame rate you want and it gives you some options on format and how to save the video. I'm not an expert on the video format methods, so I won't go much more into that. Once you have Quicktime Pro downloaded use the File drop down and locate Import Image Sequence. You will then pick the first photo in the folder you created. Quicktime will select the rest of the photos in the sequence and start the process, which can take quite a long time. Once Quicktime has created the sequence you will not be able to watch it smoothly. Go ahead and save the video and wait some more. Once the video has saved you can finally watch your video. Maybe this will encourage you to give time lapse video a try. I started making time lapse videos with nothing more than some internet searching, so if you're reading this you know about as much as me when I made my first. Good luck! Feel free to link any videos that you make in the comments. After writing my recent post on taking your kid fishing, I thought of this page on the Colorado Division Of Wildlife's website. It has plenty of ideas about where to take your kid to catch a fish nearly anywhere in the state. Check out this page: Places to take your kids fishing. This could give you some new ideas for taking your kids out, or maybe just a new place for you to go as the weather warms up. I know I hope to try some new locations this year and will try to create some posts on some of my favorite lakes and fishing locations. Geocaching, like many other hobbies, has it's own set of slang words. These words are often used when describing caches and might be confusing at first. Here is a quick list of some of the commonly used words that you may not know. I will try to update the list if I notice anything missing, or if anyone has any suggestions. Benchmark- A benchmark is a physical marker placed by NOAA's National Geodetic Survey (NGS). These are typically used for surveys and provide a known reference point. While they do not typically contain a log or items for trade, many cachers still seek these out.
. This means that the cache that you are looking at does not include a writing utensil, so make sure you bring one with you (which is a good idea anyway). DNF- Short for Did Not Find. Often marked on online logs to indicate that the person looked for a cache, but did not find it. Difficulty- A rating given to the cache to give you an idea of how hard the cache is to find once you arrive at the destination given by your GPS. Higher ratings may mean that even though you are five feet from the cache it may be so well hidden that you have a hard time finding it. FTF- First To Find. Often written in log books and on online logs to indicate that the person signing was the first person to locate a new cache. GC Code- A unique code that identifies each and every geocache associated with http://www.geocaching.com/. Starts with GC followed by additional letter or numbers. Geocache- A hidden container that contains at least a log book to sign, but can also include items to trade. Geocaching- A world wide game of hiding and seeking treasure. Anyone in the world can hide a geocache, then using GPS mark the location of the cache. Then by sharing the GPS coordinates online anyone with a GPS can try to locate the cache. Geocoin- An item that can be purchased through http://www.geocaching.com/ that has a unique identifying code. When you enter this code on their website it allows you to see what caches the coin has visited and a description of the coin by the owner. GPS- Global Positioning System. A series of satellites that works with a handheld receiver to triangulate a location on earth. See Garmin's illustrated explanation of how their GPS units work. GPSr- Slang for GPS Receiver. GPX- GPS eXchange format. A file format that allows you to download coordinates and even cache descriptions to compatible GPS receivers. Hitchhiker- General term for an item that is placed in a cache that has instructions to travel to other caches. Examples of hitchhikers are Geocoins and Travel Bugs. Latitude- Latitude is the angular distance north or south from the earth's equator measured through 90 degrees. The intersection of Latitude and Longitude create a waypoint. Longitude- Longitude is the angular distance measured on a great circle of reference from the intersection of the adopted zero meridian with this reference circle to the similar intersection of the meridian passing through the object. The intersection of Lattitude and Longitude create a waypoint. Muggle- Anyone who is not a geocacher. Based on "Muggle" from the Harry Potter books, meaning someone that is not magical. Many caches warn to be mindful of muggles who might misinterpret a cacher's search as something more suspicious. Multi Cache- A multi cache consists of two or more caches that are found as a series. Typically the coordinates first received by a cacher lead to a location that gives them a new set of coordinates. The final coordinates typically lead to a container. Puzzle/Mystery Cache- These typically require the solving of a puzzle, riddle, cypher or substitution to learn the coordinates for the cache. Signature Item- A unique item that is left behind to indicate that a specific cacher has been to that cache. Size- Geocaches come in a variety of physical sizes. Micro- These caches are very small. They typically do not include a writing utensil and may require that the log is tightly rolled up to fit right. Small- These tend to be the size of a film canister or a magnetic key holder. They may include a small golf pencil and could have small tradeable items. Medium- These tend to be Tupperware type containers that can contain a small notebook for a log and typically accommodate a fair amount of SWAG. Large- Large caches are often in surplus ammo cans or larger Tupperware containers. These have lots of room for SWAG and may contain much larger items for trade. Spoiler- A spoiler is a piece of information that may make a cache easier to find, but may also take away some of the fun of searching for it. SL- Signed Log. Often left on online logs to indicate that the physical logbook was signed. SWAG- Stuff We All Get. A general term for any and all trade items located in a cache. TFTC- Thanks For The Cache. Abbreviated thanks to the person that placed the cache. TNLN- Took Nothing, Left Nothing. Indicates that the cacher did not trade any items, but merely signed the logbook. 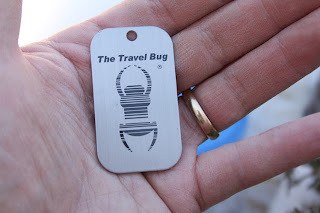 ﻿ Travel Bug- A dog tag like item that was purchased through http://www.geocaching.com/. Like a Geocoin it has a unique identifying number that links to a website showing where it has been and where the owner would like it to go. WAAS- Wide Area Augmentation System. Used to improve the accuracy of GPS receivers. See Garmin's excellent description. Waypoint- A waypoint are the coordinates for a physical location as described by the latitude and longitude. A couple days ago my wife mentioned to me that our nephew had been wanting to go fishing, but had never been before. That got me thinking about fishing, especially with children. The temperature outside right now is around eight degrees, at least it was when I got home. While ice fishing is a sport in its own right, it may not appeal as much to younger fishers, especially those without prior experience. I grew up fishing, hiking, camping, hunting and pretty much anything else I could do that was outdoors. I have many fond memories of catching fish with my dad and grandfather. In fact I still fish every summer with my grandfather. But fishing can be both fun and to many, very boring. So how to you get kids interested and keep them interested in fishing? Your child is not going to have the same ability to concentrate that you might. If the fish are biting they may stay interested longer, but eventually they will start to lose interest. Snacks and meals are always good for helping to keep kids interested. Once they have a break to eat and drink something, they will no longer concentrate on being hungry and they might be able to focus a little longer once they are done. 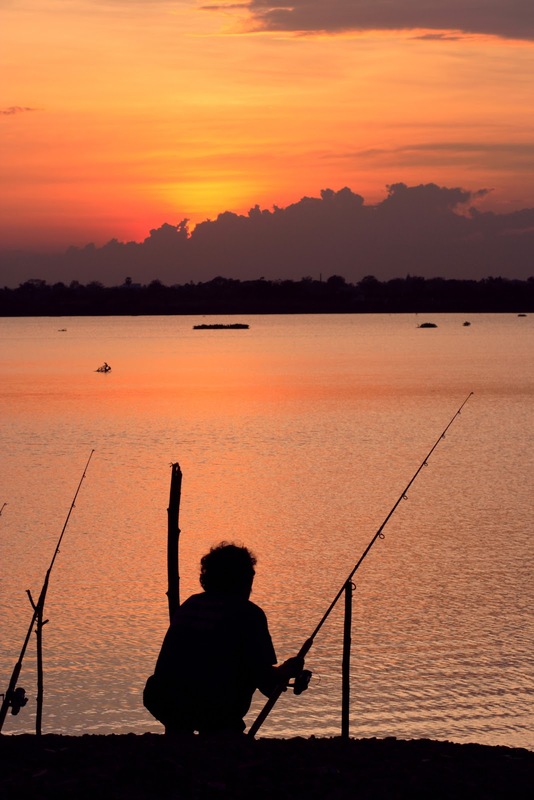 Fishing can be exciting when the fish are biting and dull when they are not. And if you are feeling like that imagine how much more your kids think so. If the fish start to bite try to make sure your kids are at the water, rods ready to go to take part in the action. When the bite slows down, let them play along the shore or back away from the water. Just make sure you keep an eye on them as water can be very dangerous for smaller kids. My son likes to throw rocks in the water, which I loved when I was younger too. I usually ask him to walk a few yards away from me to reduce the chance of scaring fish, but really as long as he is enjoying himself it doesn't really matter if I catch any fish. Specific tackle for your children. There are different ways to get your child started with fishing. An older child may just borrow your equipment, while younger children may benefit from equipment designed for them. One day while fishing with my grandfather on his boat, my daughter threw her Dora the Explorer over board while trying to cast. She had cast many times with out letting go of the pole and of course she lets go one of the few times we are in the middle of the lake. I had assumed that the rod was long gone as she broke out crying harder than she normally would. To my surprise when I looked back behind the boat I saw the tip of the rod's handle bobbing up and down in the waves. We backed the boat up and I learned that her rod had just enough bouyancy to float. Had she not been using a rod designed for a young child it would have been lost to the bottom of the lake. This is probably the hardest one for me. As I mentioned before I like to keep fishing and fishing until I run out of light, or those that are with me drag me away from the water. The key to helping your children enjoy fishing is to keep it fun. If they have to stay long after the point of boredom, they will come away from the trip with a negative impression. Especially with younger children it is important to look for signs from your kids that they are done. If they are taking breaks from the fishing and don't seem interested in fishing, even when they're biting, it may be time to leave. Gradually your kids will be interested in longer and longer fishing trips, until one day they may be just as interested as you are. These were some quick thoughts about getting your child interested in fishing and hopefully keeping them interested. Please let me know what you think and feel free to share any tips you might have. The privacy of our visitors to http://www.adventurecolorado.blogspot.com/.com is important to us. At http://www.adventurecolorado.blogspot.com/.com, we recognize that privacy of your personal information is important. Here is information on what types of personal information we receive and collect when you use and visit http://www.adventurecolorado.blogspot.com/, and how we safeguard your information. We never sell your personal information to third parties. We also use third party advertisements on http://www.adventurecolorado.blogspot.com/.com to support our site. Some of these advertisers may use technology such as cookies and web beacons when they advertise on our site, which will also send these advertisers (such as Google through the Google AdSense program) information including your IP address, your ISP , the browser you used to visit our site, and in some cases, whether you have Flash installed. This is generally used for geotargeting purposes (showing New York real estate ads to someone in New York, for example) or showing certain ads based on specific sites visited (such as showing cooking ads to someone who frequents cooking sites). Some of you may be wondering what Geochaching is. Others might have an idea, but have never tried it. This post is to give you a brief idea of what Geocaching is and how you go about getting involved with it. Geocaching is essentially a high tech treasure hunt. A geocache is a container that someone has hidden somewhere in the world and marked with GPS coordinates. The containers can vary from about an inch long and barely larger than a pencil in diameter and up to plastic totes that can hold numerous items. One of the best things about Geocaching is that it is available all over the world and there are an amazing number of them, meaning one is probably very close to you right now. If you want to look in your area there are likely many caches that you can find within a few miles of your house or where you work. Or, if you want to get to know an area better you can look for caches in your favorite park, forest, camping area or even near a relatives house. Be either looking them up before traveling or using a smart phone that allows you to access the internet you can look for caches on a road trip or your next hike. Most geocaches contain at the very least a paper log. This is placed in almost all caches and gives anyone who finds it the opportunity to log their find for the next person and everyone else who finds it. If there is room in the cache a pencil or pen may be left for you to sign, but it is usually a good idea to carry a writing utensil with you, just in case. Many Geocaches also contain "swag," or items for trade. These items might have a theme for a certain cache, or may be something significant to the person that left them. They usually have a relatively low monetary value. The idea with these items is that if you take one out of a cache you leave something else of a similar value. Some people like to leave similar items as a sort of calling card. I have seen wooden tokens with the cacher's name or nickname that show they have been there. A step up from that is "trackable" items. These usually have to be purchased before use, but along with the item, you get a website that allows the movement of the item to be tracked. One of the bigger Geocaching websites (http://www.geocaching.com/), has what they call "Travel Bugs." A travel bug is a small dog tag type device with a unique code on it. When you log onto the geocaching website you enter that unique code and you can see the history of that travel bug. The owner can give the bug a name and express any wishes they have for the bug. A sample wish might be that the bug travels around the world, or maybe visits as many National Parks as possible. You can then see everywhere the bug has been and the total distance that it has traveled. Is Geocaching hard? No, and sometimes yes. Due to the nature of hiding items the difficulty can vary largely and is often up to the person hiding the item. Fortunately there are many caches that are hidden in parking lots or smaller parks within many major cities. So for those just looking to get started or those that may not be able to cross rougher terrain there are still plenty of opportunities to find your caches. On the other hand, if you want a little more of a challenge there are caches on the top of mountains, on technical climbing routes, underwater and some that require you to solve puzzles to figure out the actual location. To help you decide which caches you want to look for http://www.geocaching.com/ lists difficulty levels for both terrain and how well the cache is hidden. Terrain can be more difficult because of of rough it is, or as mentioned above, it may take specialized means to reach the location. Difficulty of the hide can really change things up. A relatively large cache could be hidden somewhere very hard to get to, but once you do get there it could be easy to find. On the other hand, a cache hidden near a very popular store might be very hard to find since it has to be hidden well enough that someone doesn't find it inadvertently and remove it. So what exactly do you need to start Geocaching? At the very least you need access to the internet, which if your reading this, I would guess you do. Join one of the free sites, like http://www.geocaching.com/. Once you have an account you can search for caches using address,zip codes or even panning google maps withing the website to see lists of caches. Once you pick a cache you need to find it. My first cache was located using just the google map image from the website, granted that is far from ideal. One way to enter the coordinates from the website is to use a GPS capable smart phone. I found a free app for my iPhone that let me enter and navigate to coordinates. Groundspeak also offers a iPhone app that cost money, but allows you to look up, navigate to and log caches from your phone. The next option is a GPS unit. Though these can vary widely in price, they tend to be more accurate than most GPS enabled smart phone. You have to enter the coordinates from a computer, often typing them in by hand, but you get much more accurate results. The advantage of accuracy is that it gets you closed to the original location that the item was hidden, making your search easier. While this was certainly not an exhaustive explanation of Geocaching, I hope it gives you an idea of what Geocaching is. Let me know your thoughts on it below. With all of this cold weather, how can you get out and still be as comfortable as possible? Here are some tips on keeping yourself and your gear warm and working. Food/Water: Staying hydrated and eating before you go out are very important for staying warm. Having enough calories and staying hydrated helps your body to run efficiently, which translates into staying warmer. Clothing: Dress in layers! Almost anyone has heard this, but it is still great advice. When you dress in layers it gives you the option to add or subtract layers as the temperature or your activity level changes. For example, if you are hiking to a particular photo location you can start your hike with fewer layers on. Since you arrive at your destination at a comfortable destination without sweating you don't have to worry about all that sweat cooling down and making you cold. Once you stop to take photos or rest you can add a couple layers to help keep you warmer. If you tend to be cold you can also bring chemical warmers. This time of year you can find them in outdoor stores and your local big box store. These are convenient to put into boots, gloves and anywhere else you need a little extra help staying warm. Batteries: Another consideration when it is cold out is how well your batteries will perform. Even the newer lithium batteries in most modern digital cameras will lose performance as they get cold. If possible try to keep your batteries warm. If you are using a compact camera you might be able to keep it in a pocket where it stays warmer, though be careful of condensation, more on that later. Another option would be to carry extra batteries. If your camera takes AAs it can be easy to get an extra set, even with rechargeables. If your camera uses proprietary batteries you may have a longer battery life, but they can cost more to get extras. If you can get at least one extra battery. To help prolong the life in cold weather you can keep one in a pocket while you are using the other. Then as the first drains you can switch the batteries. There is a good chance that the depleted battery will still have some life left in it once it is warmed up. Cameras In The Cold: Your camera may not do well in a blizzard, where it may get wet, which in turn can lead to buttons and dials freezing. But if it is only cold outside you can most likely continue to use your camera below freezing. Follow the tips above for batteries to make sure your camera has power to keep running. Also try to keep your camera free from condensation. One easy cause of condensation in cold weather is changing temperatures quickly. This is often caused by going inside from the cold or potentially the other way around. Whenever moving from cold to hot try to keep your equipment protected from the extreme temperature change. One easy way is to put your camera in a bag, even a trash bag, that is the same temperature. Then when you go inside the bag will shield the camera from a quick temperature change and will allow your delicate electronics to warm up more slowly, reducing the chances of condensation forming. Handling the Controls: If you are taking quick snapshots you may be able to keep gloves on while shooting, especially if you try to pick out gloves that give you enough dexterity to handle the controls of your camera. But when it gets really cold out you may want more options. Look into fingerless gloves that have a mitten that can cover your fingers, or fold out of the way to temporarily give you more control. Another option that works will with mittens is a remote release. Many cameras, especially DSLRs, have the option to use a release on a short cable that you could put inside a mitten or glove, allowing you to manipulate the shutter from the warmth of your glove. Memory: While most memory cards shouldn't have too much difficulty in the cold weather, you may still want to plan ahead. I like to use the higher capacity cards in cold weather to reduce the need for card changes in the middle of a photo shoot. Each time you change cards in the cold means another opportunity to drop a card in the snow. Digging around in a snow bank for something you dropped, especially something as small as a memory card, is not fun. The list was not exhaustive by any means, but hopefully it gives you a few ideas on how to make your photography experience as enjoyable as possible, even in the colder weather. The frigid weather in Colorado the last couple weeks has kept many people inside, including me. But don't dismiss this time of year as for staying inside only. For those that don't like to be outside in the bitter cold you can try to plan an outdoor excursion during one of the warmer days between snows. All of this snow that we have been getting would be great for breaking out a set of snow shoes if you have them. If not, you can find a local outdoor store that rents them. With fresh snow on the ground it would be easy to take to the trail along the front range. There are many great parks out there within easy driving distance of the Denver Metro Area. Several of them offer great views of the city as you start out and reward you with breathtaking views of the mountains once you get higher up. Don't forget to take your camera too! There are many great opportunities to photograph views that are unique in the winter. Enjoy!